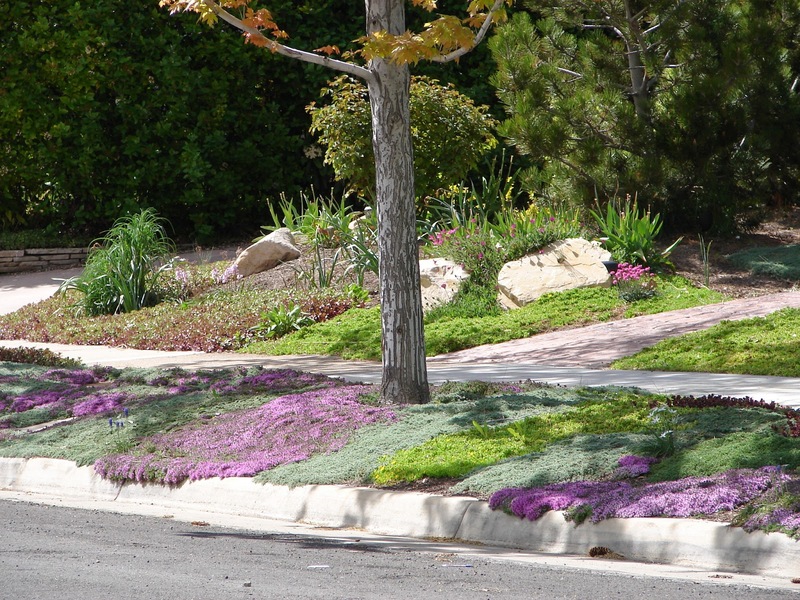 Ground cover thymes can be a great choice for water wise park strips, patios and pathways. Regular thymes are like tiny shrubs and are used for culinary or ornamental purposes. Ground cover thymes are fragrant like regular thymes, but they creep and spread out and can fill the spaces between stepping stones and pavers. While they can tolerate some foot traffic, they are not as durable as turf grass so they are not recommended as a lawn substitute unless you can guarantee that no people or dogs are going to run and play on it. Some varieties will bloom in spring and summer and will create stunning carpets of TINY pink flowers. Ground cover thymes stay almost flat on the ground and will continue to spread year after year. They need water only during the hottest times of summer; June through August, maybe once a week. Plant them in full sun or part shade. Sometimes the older parts of the plants die out and need to be replaced. There are many varieties of ground cover thyme to choose from and your local independent garden center should carry several: woolly thyme, elfin thyme, pink chintz thyme, etc.